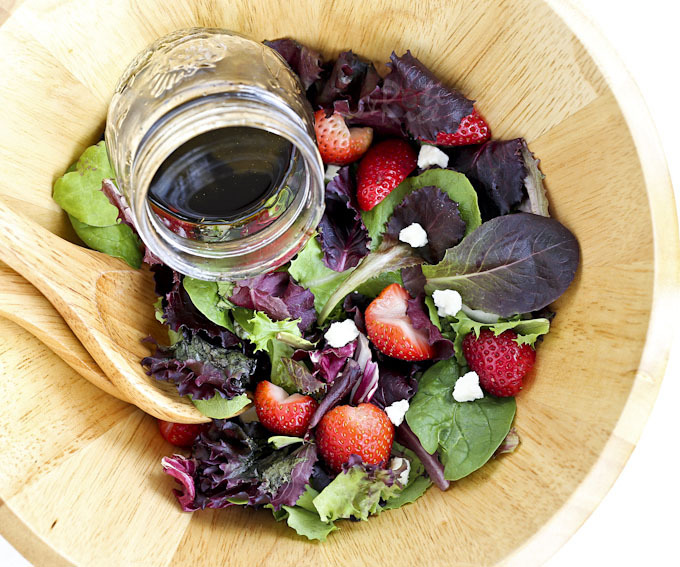 This Spring Greens, Strawberry, and Feta Salad with balsamic vinaigrette has a sweet salty combination that is sure to tease the taste buds. I like cooking with seasonal produce because it always feels right. As the weather warms up, I try to incorporate more fruits and vegetables in our daily diet as we do not need the bulk required to generate energy and heat. It also gives us a chance to shed those few extra pounds gain during the winter months. Salads become a mainstay, and I normally buy a pound of spring mix each week. Two to three times a week, Ro-Ri San gets a salad bento for work. Strawberries have become increasingly available year round but their peak season is between April and July. They are the most fragrant, juicy, and sweet at this time of the year and there is an abundance of it at the grocery stores. Not only are they delicious but they are also very good for us. It is high in vitamin C and packed with phytonutrients essential for good health. No wonder that it is the most popular berry fruit in the world. Strawberries also add aesthetic appeal to a dish. These beautiful ruby colored fruits with yellow seeds piercing its surface and regal green leafy cap conjure up images of flower and garden fairies. I am sure many of us remember having read fairy tales with beautiful illustrations of these ethereal beings. Continuing with my weekend food find post, this is the Spring Greens, Strawberry, and Feta Salad – a sweet salty combination I made to go with the rest of the meal. I added the wonderful Greek feta that I bought and made a simple balsamic vinaigrette dressing to go with it. It had a kind of sweet salty combination with the sweetness coming from the strawberries and saltiness from the feta. It was a delightful salad. In an empty bottle, combine all dressing ingredients. Put the lid on and give it a good shake. Place spring greens in a salad bowl. Drizzle vinaigrette over greens and toss well to coat. Add sliced strawberries and feta cheese. Give it a light toss. NOTE: This post was updated on April 20th, 2015 with new pictures. No changes were made to the recipe. Such an eyecatching vibrant and beautiful salad. What a beautiful salad. Strawberries definitely are the best thing to add to a salad when you want to kick it up a couple notches. And that is a gorgeous flower. A gorgeous, light and refreshing salad. I've always loved strawberries with balsamic vinegar and it goes equally well with feta. A perfect combination! That looks great. I love sweet/salty combos. Yum! Ah..thats a gorgeous and colourful dish….the snap of the flower is awesome…. I just love to eat this salad, I make one for myself; check it out http://candcdish.wordpress.com/2010/04/04/salad-with-strawberries/ Delicious and simple salad! Love strawberries with bento. This looks grand! 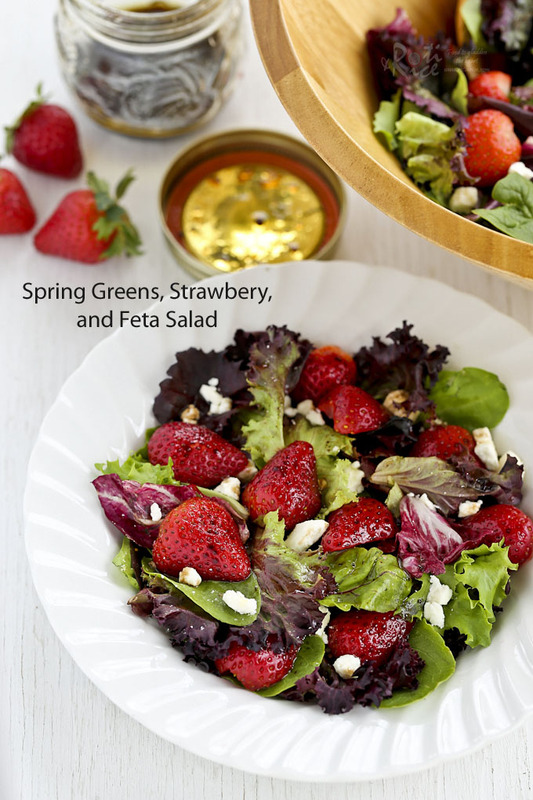 Those greens with the feta and bright beautiful strawberries look fantastic. I really enjoy salads like this. Fresh and flavorful. Just looks delicious! I eat this alot in the summer as strawberries grow right down the street. Salads with greens and fruit are so refreshing. Beautiful display of yummy freshness! 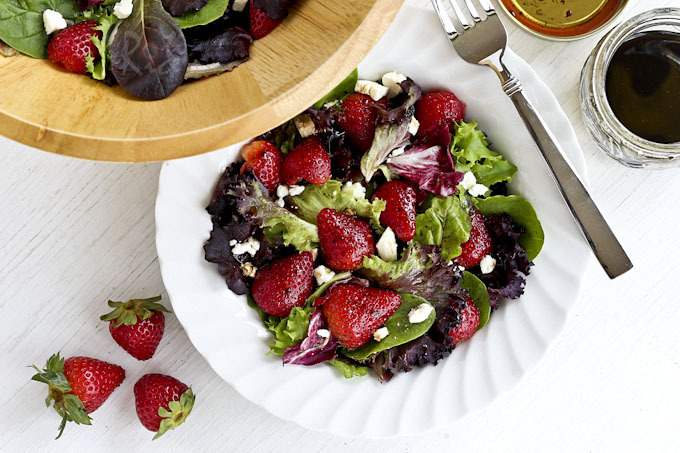 I adore strawberries and feta, so this salad is perfect. Thanks! 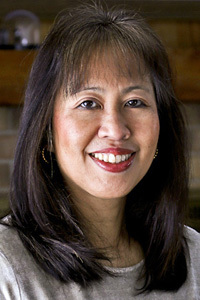 denise@quickies on the dinner table – I really like the salad and have made it several times. Perfect for this time of the year. The flowers are a consolation of spring after a long and bleak winter. You won't envy me come winter. Rick – Thanks! My hubby enjoys bento salads during the warmer months. Casey Angelova – It is a surprisingly good combination! What a gorgeous salad! Love the combo of strawberry and feta. The flower is beautiful! Very colorful and healthy salad!